Which Royal Garden Will Be Meghan Markle’s Favorite? She loves roses, peonies and all pink blooms. And soon Meghan Markle will have a host of royal gardens to indulge her passion. Which will be her favorite? Official London residence of the British Royal Family since 1837, Buckingham Palace has beautifully landscaped gardens. Every year the Queen hosts a series of garden parties for invited guests, and on her Diamond Jubilee in 2012, she invited members of the public to picnic in the grounds Maybe Meghan and Prince Harry will have a picnic of their own there some time soon! If you’ll be hosting an outdoor party this summer, take a look at these 12 great tips for planning a backyard barbecue. It’s likely that the Sunken Garden at Kensington Palace is Meghan’s favorite royal garden because she and Prince Harry announced their engagement there. And of course, Kensington Palace is to be their new home. Modeled on a classic garden at Hampton Court Palace, this stylish garden was also a favorite with Harry’s mother, Diana Princess of Wales. Stone pathways are a standard feature of a classic sunken garden. Find out how to build your own stone pathway with our easy-to-follow instructions. If you visit or stay at Balmoral Castle during the summer (yes, you really can stay in a royal residence!) perhaps you’ll catch Meghan Markle exploring the gardens. The Royal Family spends the summer vacation at the Queen’s private residence in Scotland. Three acres of gardens include formal plantings, a kitchen garden, Victorian glasshouses and a water garden. Here’s how to create your own water garden complete with waterfall. The Royal Family spends Christmas at the Queen’s private residence in Norfolk, and it’s famed for its stunning gardens covering nearly 60 acres. There are lakes fed from natural springs, bog gardens, a romantic rockery, a grotto and beautiful woodland walks for Prince Harry and Meghan to enjoy. And a century-old summerhouse makes the perfect viewpoint. Would you like your very own summer retreat space? Here are complete how-to construction plans for a classic cedar screen house. Prince Harry and Meghan are tying the knot at St. George’s Chapel in Windsor Castle, the Queen’s weekend retreat. Covering 13 acres, this royal garden boasts a riot of color in its herbaceous borders, eye-catching greenery in its shrubs and beautifully scented rose gardens (pink is rumored to be Megan’s favorite color). If roses are your thing, here are 10 suggestions for truly unmatchable blooms. We think Meghan would love the Peachy Knock-Out! Visiting the in-laws will be a pleasure for Meghan. 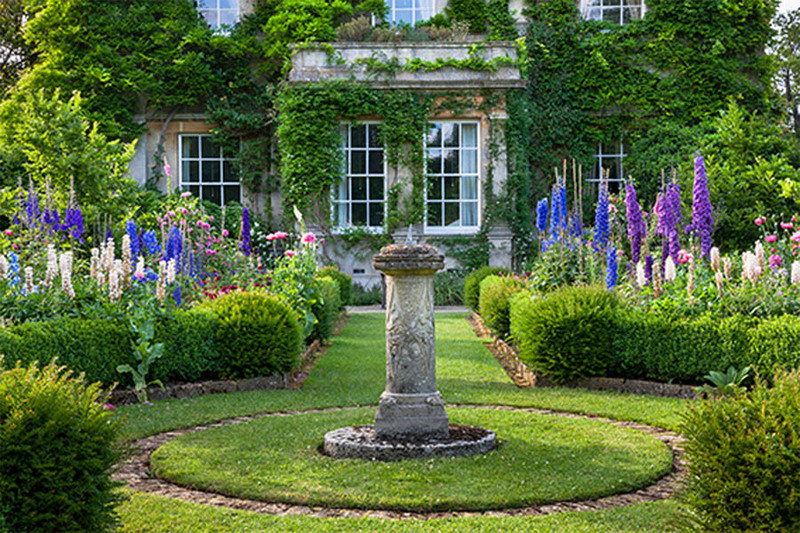 She and Harry can look forward to wandering in the beautiful gardens at Highgrove House, managed personally by Prince Charles with a firm emphasis on sustainability and living in harmony with nature. The Wildflower Meadow is especially lovely, and a haven for all kinds of wildlife. Do your bit for nature by following these tips for a wildlife garden. The Isabella Plantation is one of the best-kept secret royal gardens. Located in Richmond Park (a Royal Park), this plantation has a multitude of azaleas and rhododendrons that create a rainbow-hued magic carpet when they’re all in bloom. Meghan and Prince Harry could also sneak a peek at the semi-tame deer as they journey through the park. Azaleas and rhododendrons thrive in shady spots. Check out our guide to other colorful shade-tolerant plants for your backyard. Although no longer owned by the Crown, Hampton Court Palace is one of the most famous UK royal palaces, built in 1515 and seized by Henry VIII for his home in 1529. There are 60 acres of formal gardens and 750 acres of park land, enough to satisfy the most avid gardening longings of the newest royal princess. There’s even a maze to get lost in! Hampton Court Gardens have a magnificent display of spring-flowering bulbs. Why not try these varieties in your backyard?